Irishman Sean Connor arrived in Zimbabwe earlier this year hoping to have a big impact on the game in the country. But his stay has ended with him taking his club, CAPS United, to court for a settlement after he was fired following a run of poor results. Connor believes that his assistants conspired against him to lose matches in order for him to get the sack. "I came here hoping that I really could have an influence and change the game for the better, but I never had a chance here," Connor told BBC Sport. "When I came out the owners had a very clear vision of what they wanted - a club run on a much more European basis, and I tried to implement those ideas." Four-time champions CAPS United went on a run of six games without a win and dismissed Connor, but soon after parting ways the club discovered what it believed was a plot to undermine the coach. A defender and the first-choice goalkeeper were fired by the club for working against the interests of team by deliberately trying to lose games, although the two players denied the allegations. "I don't think anyone could believe the extent of the sabotage that was going on," said Connor. "It was hard knowing that your staff were working against you along with maybe one or two players, and ultimately the parting of ways was best for all of us." 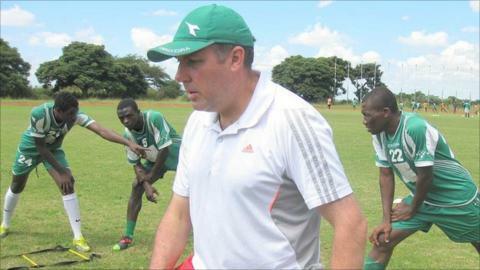 The Irish coach also struggled with the widespread belief in juju, or magical powers, in Zimbabwean football. "It's rife, I never believed in it, but if the players believe in it then that's probably the way it works," he explained. "We were told that if a certain guy sits behind the goal that we're attacking then we're not going to score, and you'd see salt and things thrown in the changing rooms and water in the corners, and players would tell me they had no power in their legs. "It's hard for me to understand it, I tried to ignore it and work hard and we went on a better run, but there was all this bubbling under the surface." Connor is hoping to leave a legacy in Zimbabwe by setting up a youth academy with links to European clubs. But after his experience at CAPS United he feels that it is unlikely that he will coach again in Zimbabwe. "In football you never say never, but I think to come back to Zimbabwe I'd have to be very careful with the club I picked and make sure that the staffing appointments were my own. "The players are technically very gifted but for me what's holding them back is the lack of willingness to embrace some of the new ideas and methods. "But the supporters are fantastic, it's a beautiful country, and if the structures are changed there's no reason why Zimbabwe can't qualify for the Nations Cup or even the World Cup one day."